Are you ready to do battle? Don your horned helmet and grab your battle-axe; it’s time forNetEnt’s new Norse-inspired video slot game. With Norse Gods such as Thor, Loki, Idun, and Freya, you can now smash your way through the slots to divine riches. In this simple, but aesthetically immersive video slot, you’ll lose yourself in a world of hammers and axes, mythical monsters and Norse Gods. One of the biggest names in the industry, NetEnt are a slot gaming giant and online casino pioneer from Sweden with over 20 years in the industry. They boast a wide range of over 200 premium slots with everything from franchised games such as Guns N Roses and Planet of the Apes to Home-grown classics Jack and the Beanstalk, Gonzo’s quest, and Space Wars. Their award-winning games are all easy-to-play, immersive, and jam-packed with bonuses and rewards.You can find them at over 170 of the world’s biggest online casino sites. Hall of Gods drops you in atempest, depicted by the backdrop landscape and stormy soundtrack. The reels are populated by Norse Gods, weapons, and mythological treasures. It is a classic 5-reel slot, with 20 win lines, your familiar trio of Wild, Scatter, and Bonus symbols. Coin values range from 0.1 to 50, although the lowest bet is .20, so you can bet as low or as high as you would like. The Wild symbol substitutes any others, except for Bonus and Scatter, saving you from a fate worse than all of the Norse monsters: being one symbol short of a win. When activated, the Wild symbol expands to fills the reel, giving you even more chances to win. Bonus: Thor’s divine power ushers in Hall of Gods’ bonus game when 3 bonus symbols grace your reels. Win increasingly bigger Jackpots when you bet higher. Just smash the shields with Thor’s almighty hammer, match three jackpots or coin prizes, and reap the rewards of your battles. Scatter: Land 3 or more Scatter symbols, and disband the monstrous carrion crows that feast on your wasted spins. But left behind by the birds of death are free spins to reward your bravery. 3=10 free spins, 4=15, and get 5 scatter symbols to win a massive 20 free spins. If that’s not enough, free spins also pay x3 on winnings. Praise the Gods! 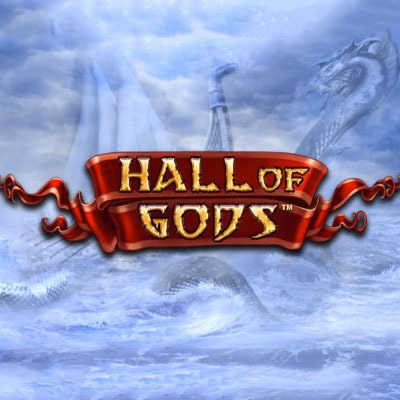 Hall of Gods is an epic video slot that turns the excitement and epic factor up to 11, thrusting you intoa mythologicalworld of Norse Gods, axes, hammers, and battle. The animations are fantastic, the sound effects and music immerse you all the more, and there is a slew of exciting bonuses to reap the rewards of your labour, including the shield-smashing bonus game.